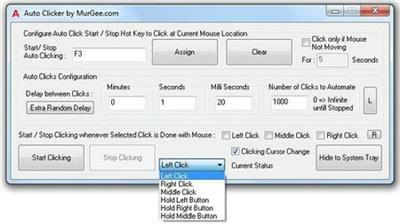 Auto Clicker for Automatically clicking Left Mouse Button with Keyboard Shortcut. Download and install Auto Clicker and let the Software do the Mouse Clicking and give your fingers some rest. Start / Stop Auto Mouse Cursor Clicking with a single System Wide Shortcut.